You know that feeling when you see a crap ton of games go on sale for like a dollar and you figure that you may as well buy the stuff that’s on sale cus it’s a “great deal” and then never play those games you got on sale… That’s basically me every week when I log onto Comixology every week because Comixology has weekly sales for manga as well as normal comics. In my last spending spree, I purchased a little series known as Drifting Dragons, which is basically about whal- draking, which is hunting sky wh- I mean dragons. What caught my eye about the series besides its ludicrous $1 price tag at the time was how similar it looked to the manga of Nausicaa Valley of the Wind. Since I also already read a few chapters of the series on… less scrupulous sights, it was pretty easy for me to purchase the 1st volume of Drifting Dragons. After finishing the first volume, all I can say is that I’m so glad I got the first volume and the 2nd and 3rd volumes on sale because it’s beautifully fun mangas I’ve read in awhile. The art work simply stunning as you can see below. I just love how the artist used his shading in the manga because it gives the entire manga a story book like feeling. Plus the shading makes all of the key moments in the manga pop. I also loved the breezy feeling of the entire manga. The entire crew of the sky whaling ship feel like a bunch of lovable screw ups that take their jobs seriously, but they like to have fun with each other as well. 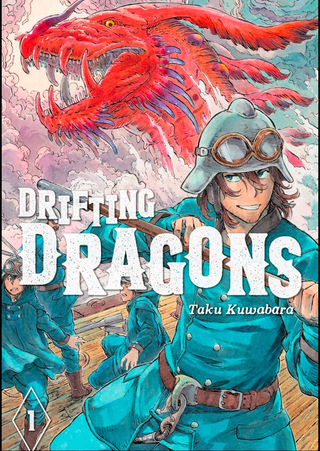 If you have some time and some spare cash, I would heavily recommend that you check out Drifting Dragons if you like the fantasy genre, but want to read something with a more grounded and non-narrative focused manga with gorgeous artwork. Plus, the first 3 volumes of the series are currently on sale on Comixology for roughly $6. So it’d be a good time to pick up the series even if you don’t read it right away.